Summer is one of the most liveable times of the year. The days are longer, the weather is milder and everyone seems to be in a far more palatable mood. However, with summer comes a new influx of new concerns: sunburn, jellyfish, heatwaves and hordes of unwanted insects! Commonly, summer is when ants start to invade your home. 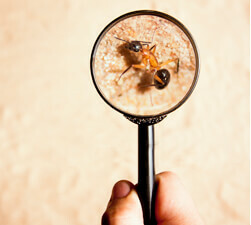 Ants can get into all levels of your house, any room in your home, and every unsealed morsel of food. Stick to the following tips so your home doesn’t become the residence of summer’s most annoying insect. Kitchen hygiene will be your best precautionary defence in combatting an ant invasion this summer. Ensure that you promptly clean up after meals, as well as throw out any half-opened food packets that have been lying around in your fridge or pantry. Perishable foods should be refrigerated and open boxes of cereals should be kept in airtight containers. If you keep your surfaces clean, once the ants have disappeared, they tend not to find their way back. This is because ants leave chemical trails, that signify how they accessed your house and also the trails to any food sources. Ants also hate citric acid, so one of the best solutions to clean with are vinegar or lemon juice mixed with water. Ants can only get into your house if there is an access point. That’s why it’s essential that you, to the best of your ability, close any gaps where they’ve entered. Seal the house as much as possible, and coupled with the aforementioned cleaning techniques, this should adequately sort out any mild ant problem. If your ant problem - or any other pest problem you may have - seems to be unrelenting, don’t hesitate to call the professionals. Although the tips we’ve mentioned are great remedies, sometimes you just need the strength and protection or a professional solution. This summer, don’t let ants become your extended family. Keep your kitchen and surfaces clean, as well as sealing up any entry points ants may have into your home. If you have an ant problem, or an issue with any other types of pests in your home, don’t wait until it’s too late - call Dawson’s Pest Control today!